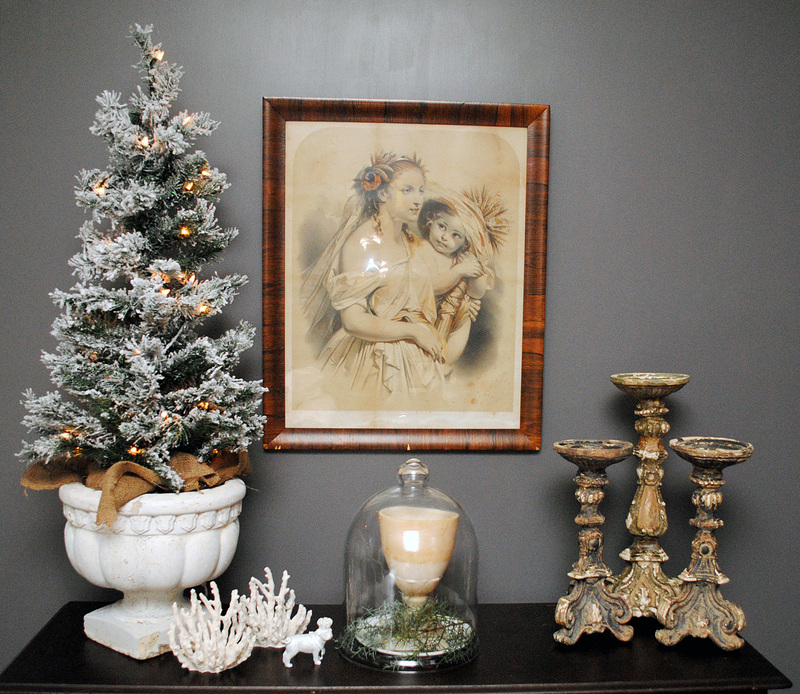 I’m breaking down the Holiday Decor in another room of our home today. Yesterday I posted about our Family Room and today’s post is focused on the Living Room. I added some additional greenery to this room recently. 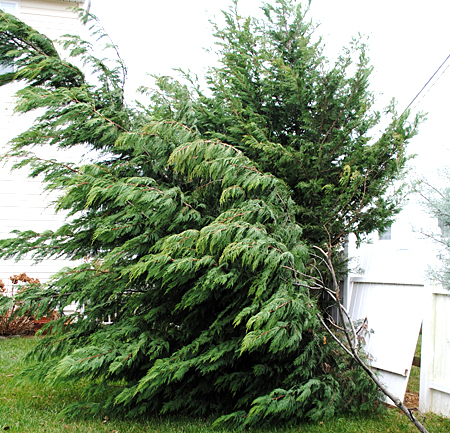 During Hurricane Sandy, one of our Cedar trees was uprooted. I had hoped we could save it, but the insurance adjuster just told us that it’s going to have to be removed in order to fix the fence. Since it can’t be saved, I decided I might as well cut off as many branches as I want, to use in our decor. Here you can see the poor tree, and the fence that it damaged. I’m so sad to loose this tree, since it blocks the view of our neighbor’s deck when we are on the patio. I guess we’ll plant a new one in the Spring. This is an updated photo of our living room. A bit brighter than the photos I took last week when it was pouring rain. 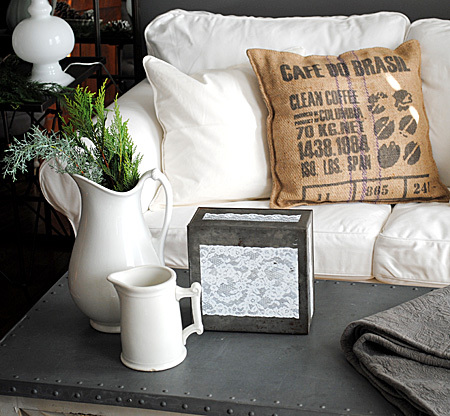 You can find the Tutorial for the Vintage Painted Lace tin HERE. I also glittered up some Pine Cones this year! 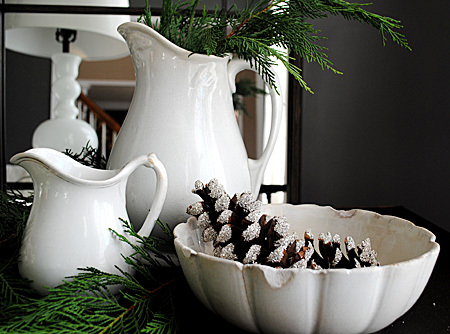 I love the contrast of the sparkle with the dark woody tones of the cones. I’ll be posting that tutorial soon. Or at least I hope so anyway! 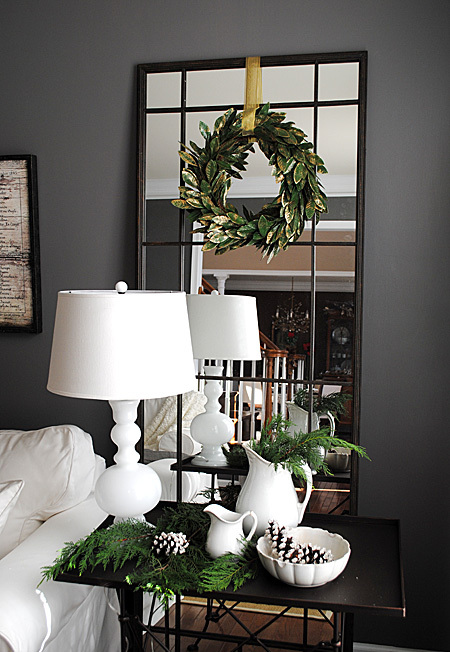 I love this wreath that I got at TJ Maxx, one of my new favorite places to shop, now that we finally have one! I was able to get two of these, the last two, and I hung them on the big Iron Mirrors that I have on either side of the sofa. 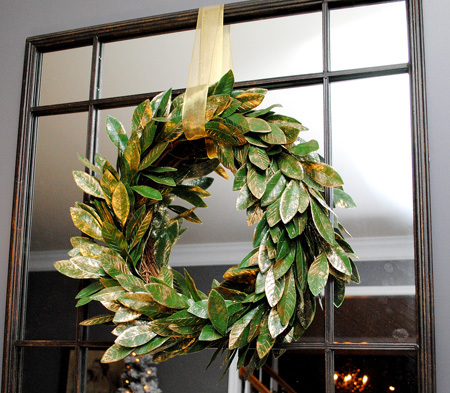 I love how the green leaves are brushed slightly with gold, so pretty! 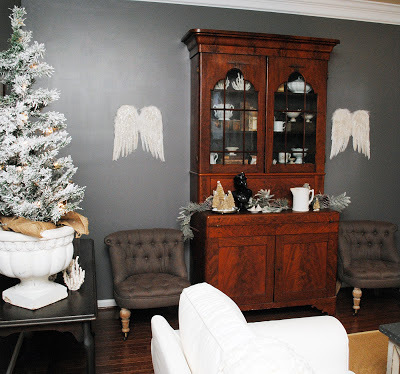 This white chair was in my family room and I moved it in here to make room for our tree… which means I had to move the little tufted chairs against the wall, to make from for the white chair! Anyway, it all worked out perfectly and I’m kind of really liking this set up. I lucked out and found a second pre-lit Flocked Tree at Lucketts! It was a great price and the exact size that I wanted for this room. I love how it fits perfectly in my Antique Concrete Urn! 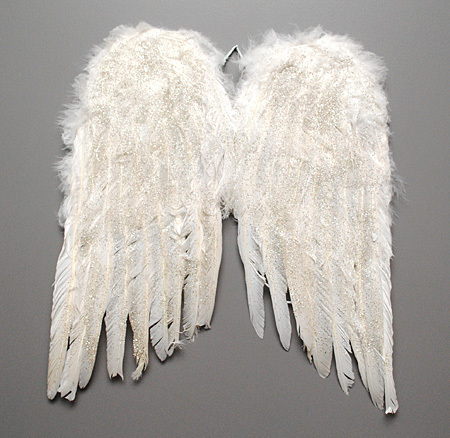 I snagged two sets of these feathered Angel Wings at Lucketts too, they were in my friend Jennifer’s space and she gave me a great deal on them. They are glittered too, which adds some nice extra sparkle on the far wall. 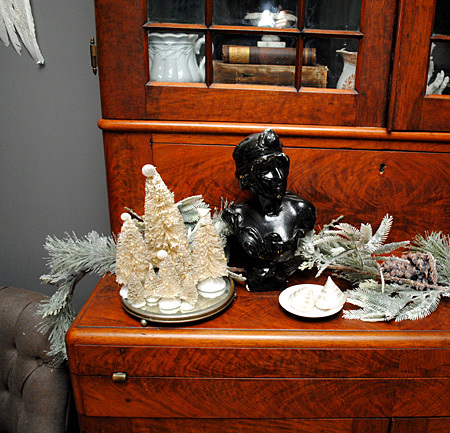 I placed my White Wire Brush Trees on the Antique Secretary that belonged to my Grandparents. You can find the Tutorial for the Trees HERE. Well that’s it for this room! 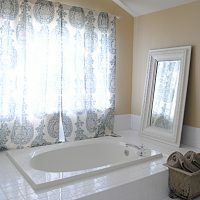 I’ll be posting a few more projects this week and then I will continue with the final two rooms after that. Thanks so much for stopping by! Very pretty, Karen! 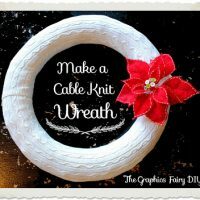 I’ll be watching for the sparkly pinecone tutorial. Karen…you are inspiring me all the way to Iceland! Oh, that’s lovely! Thank you Brynja! It’s stunning, Karen. I love the glittered pinecones too. You’re right, the contrast is perfect. Just gorgeous Karen. I love the pinecones too. They look large. Too bad about your tree. Thanks Diane! Yes, I will miss the tree, we planted it about 7 years ago and every year we used to marvel at how much it had grown. Hopefully we can replace it, with one that’s not too small. Lovely, beautiful and serene…glad you got to use the tree at just the right time of year. Beautiful Karen! 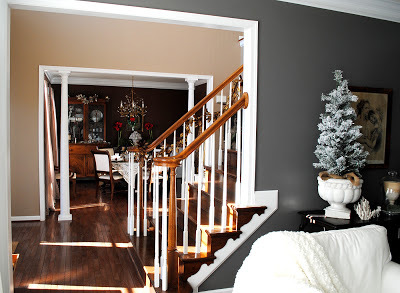 Your home is an inspiration to me as I am working to paint and decorate a new home right now! 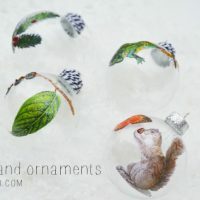 Thanks for the tutorial on the bottle brush trees, watched it just now and adore them, and I’d love it if you did a tutorial on the pine cones, they are so lovely! Sorry to hear about your tree, they grow so slow and you can mark the passage of time with it’s growth. It’s great though that you salvaged and used what you could. 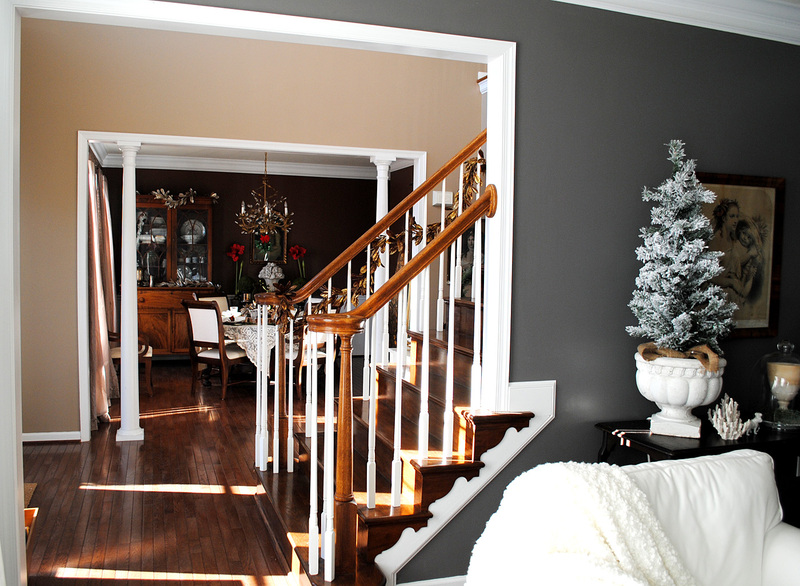 Look forward to seeing more of your gorgeous home! Thank you Pendra! I’m still going to try to squeeze the Pine Cones in still, hopefully I’ll have time before Christmas! 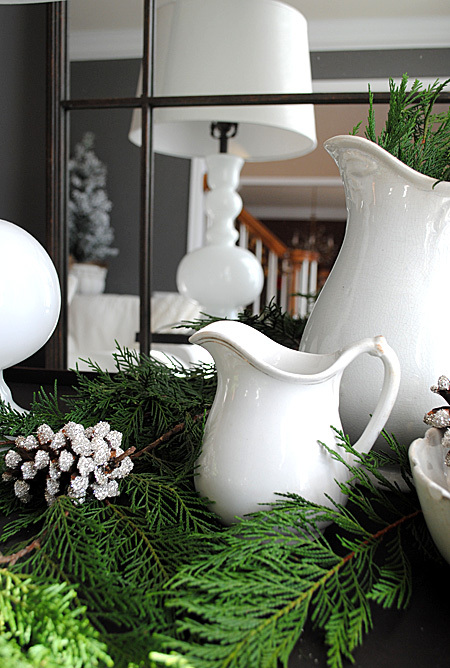 Very, very pretty–and so classy! Classic stuff! It looks very simple, natural and green. Feathers and Horse picture look amazing. 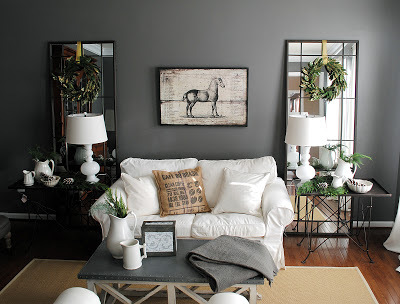 From where I can get these decorative accessories? Karen?